Why? After laboring over raviolis made from scratch and rolled out by hand, I was greatly disappointed (and very irritated) when they all stuck together in the colander. I'd hardly turned my back, giving them just a moment or two to drain while I put the finishing touches on the sauce. After all that work, to have them stick together. I could have screamed. With Cuisinart's Pasta/Steamer Set, I lift the pasta straight out of the water and pour it directly into the sauce. There'd be no time for the noodles to clump together. 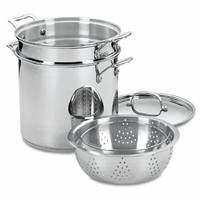 And not only does the Cuisinart Pasta/Steamer Set include a 12-quart stockpot and pasta insert, it also includes a steamer basket and lid. All pieces are constructed of mirror-finished 18/10 stainless steel. And all are dishwasher safe as well as oven-safe to 550 degrees Fahrenheit. An aluminum disk is encapsulated between two layers of stainless steel in the base, eliminated hotspots and ensuring even heating. The handles stay cool on the stove top and the tight-fitting lid keeps in nutrients. The steamer basket can be used for crisp, healthy vegetables or as a means to reduce fat by steaming instead of frying foods like pot stickers. The set comes with a limited lifetime warranty, which unfortunately doesn't cover the one problem I have with the pasta/steamer set: where am I going to fit this beast in my already full kitchen?